By Xah Lee. Date: 2006-06-30 . Last updated: 2010-08-10 . Many Microsoft keyboards now have a F Lock key. This page discuss its problems, and how to disable it. The F Lock key, above the Backspace key. Microsoft introduced a F Lock key. It functions as a toggle. When it is off, the keys F1 to F12 have the following purposes. It's is very easy to disable it. Just redefine the special functions to type F keys. So that, doesn't matter F Lock is on or off, the F keys always send normal function signals. Open your IntelliType software, under 〖Start ▸ Control Panel ▸ Keyboard〗. Click on the “Key Settings” tab. Now, go to the item named “Help”, double click it (or click the “Configure…” button) You'll get a pop up dialog that lets you redefine the key. Choose “Choose from a list of commands”. Then click “Next”. Now, press the F1 key. Click OK.
Now, repeat the above for each of the “Undo”, “Redo”, “New”, “Open” … definitions. Click OK to exit the Keyboard Properties dialog. What's the Problem of the F Lock Key? This F Lock key is a pain because the behavior of a function key depends on the state of the F Lock, so that a user often pressed a function key only to find it do something unexpected. For example, when the F Lock is off, F5 does Open. In a web browser, the Open command is almost never used, and F5 is normally Refresh, much more useful. So, while in a browser, you want F Lock to be on. But in a word processor, it's more useful for F5 to be Open, not Refresh. This means, your muscle memory will be thwarted. You have to constantly remember which application you are in and whether your F Lock is on or off before you press that key. Many applications make use of the function keys heavily. For example: programer's text editor (Emacs), terminal emulators, 3D Modeling software, Games (Second Life). The need of F Lock as a improvement is itself questionable, because the function key themselves are already intended to be programable, so the pre-programed behavior with F Lock off is a redundant step. For example, with F Lock off, F4 is Open Document. The same Open Document can be programed into F4 without a altered state of the key. Theoretically, F Lock doubles the function key's purpose as if adding another row of function keys. 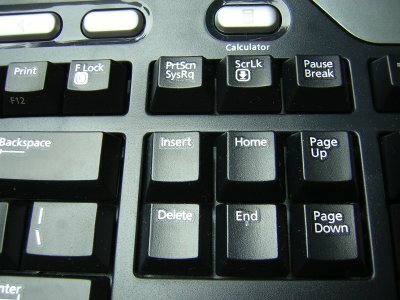 But, in practice, few people actually need more than 12 shortcuts provides by function keys. If they need more, it can be done by holding one of the modifier keys (Ctrl, Alt, Shift) with function keys. (For example, 【Alt+F4】 to close window) Holding down a modifier key while pressing a function key, is easier to remember as well as operate, than the expensive mental cost of checking the F Lock state and then making a action decision.